• Honorable Mention at IPA – International Photography Awards (Los Angeles, 2016), with the series From wood to concrete in the category People, Lifestyle (Professional). • Honorable Mention at the MIFA – Moscow International Foto Award (2016 – Moscow), with the photo Before the light, before the dark in the category Portrait (Professional). • Honorable Mention at the MIFA – Moscow International Foto Award (2016 – Moscow), with the photo On board in the category Life Style (Professional). • Finalist at the contest Black and White Spider Aawards 2016 with the photo Etna Volcano. • Honorable Mention at the MIFA – Moscow International Foto Award (2015 – Moscow), with the photos Gallura – Light and shadow in the category Fine Art – Abstract (Professional). • Honorable Mention at the MIFA – Moscow International Foto Award (2015 – Moscow), with the work Survivors in the category General News/Portrait (Professional). 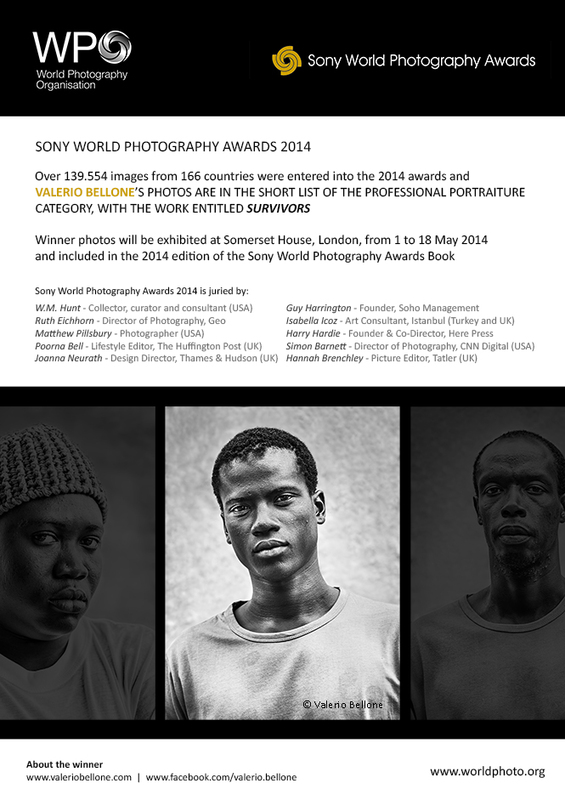 • Short list at the Sony World Photography Awards (2014 – London), in the category Portraiture (Professional), with the work Survivors. 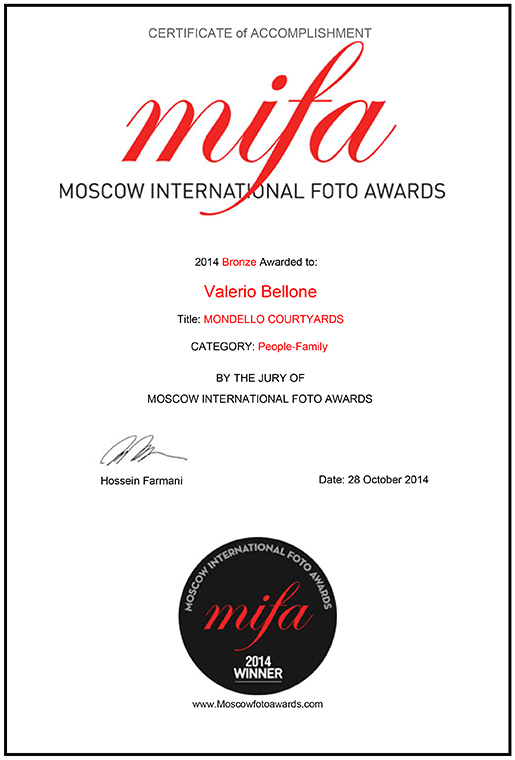 • Winner at the MIFA – Moscow International Foto Award (2014 – Moscow), with the work Mondello courtyards in the category People – Family (Professional). 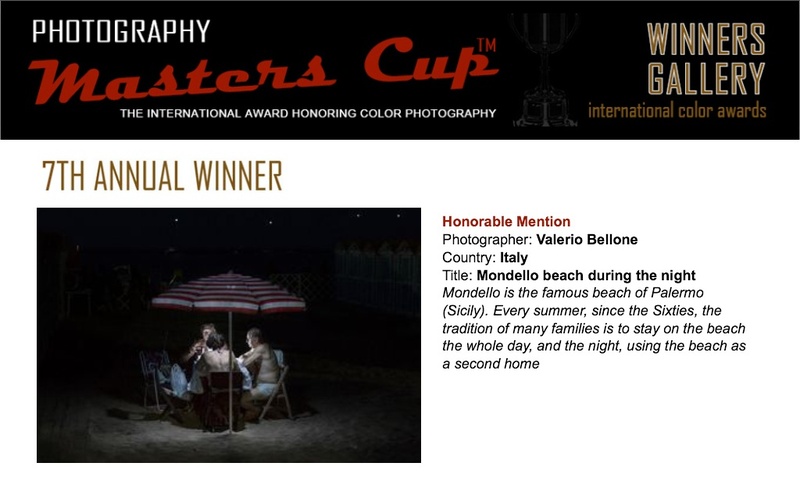 • Honorable Mention at the 7th Annual Photography Masters Cup (International Color Awards, 2014 – Beverly Hills), with the work Mondello courtyards in the category People (Professional). • First Prize at the PX3 (Paris), category Book/People (Professional) with the work Flussi. • Second Prize at the PX3 (Paris), category Press/Sports (Professional) with the reportage Cuore Rosanero. • Honorable Mention at the 7th Black and White Spider Awards with the project Autoscopia – Beverly Hills (USA). • Honorable Mention at the PX3 (Paris) with the project Light on me. • Honorable Mention at the PX3 (Paris) with the project Autoscopia. 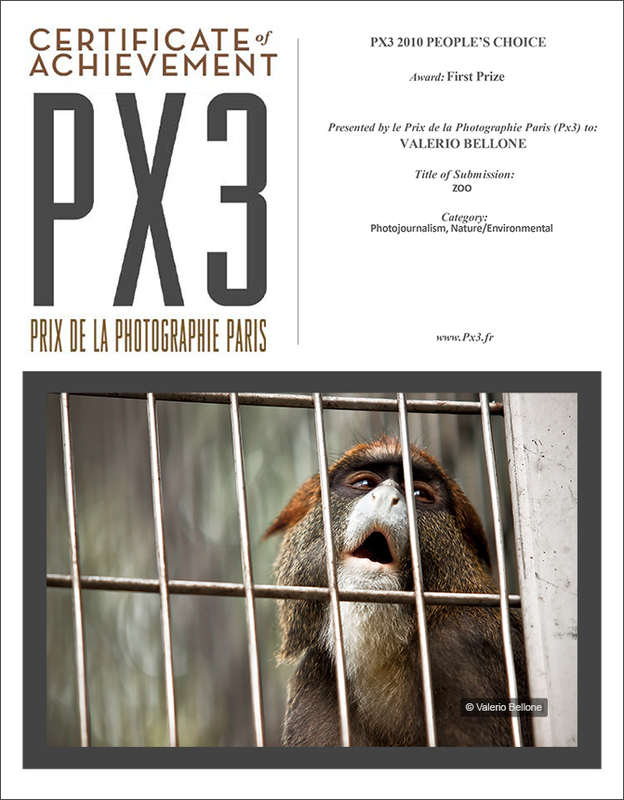 • First Prize at the PX3 (Paris), section “People’s choice”, category Photojournalism, Nature/Environmental with the photo Zoo.